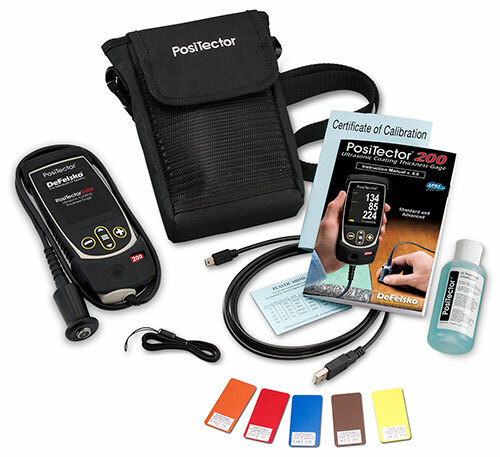 The PosiTector 200 non-destructively measures a wide variety of applications using proven ultrasound technology. Measures coating thickness over wood, concrete, plastics, composites, and more. Advanced models measure up to 3 individual layer thicknesses in a multi-layer system and features a graphic readout for detailed analysis of the coating system. Available as either Standard or Advanced models and your choice of 3 probes. Standard models (Std) measure the total thickness of a coating system. Advanced models (Adv) measure total thickness of a coating system OR up to 3 individual layer thicknesses in a multi-layer system. Also feature graphic readout for detailed analysis of the coating system. NEW! WiFi technology wirelessly synchronizes with PosiSoft.net, downloads software updates and connects to mobile devices for expanded functionality. Free apps available to connect to mobile devices. NEW! D probe measures thicker coatings. Ideal for measuring polyurea. 6 models - Choose from Standard or Advanced features with your choice of 3 probes. 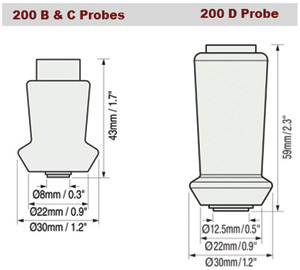 Universal gage body accepts all PosiTector 200, 6000 III, DPM, SPG, RTR, SST, SHD and UTG probes easily. Advanced models include WiFi, Graphics, Screen Capture and onscreen batch annotation. USB port for fast, simple connection to a PC and to supply continuous power. USB cable included. PosiSoft USB Drive - stored readings and graphs can be accessed using universal PC/ Mac web browsers or file explorers. No software required. 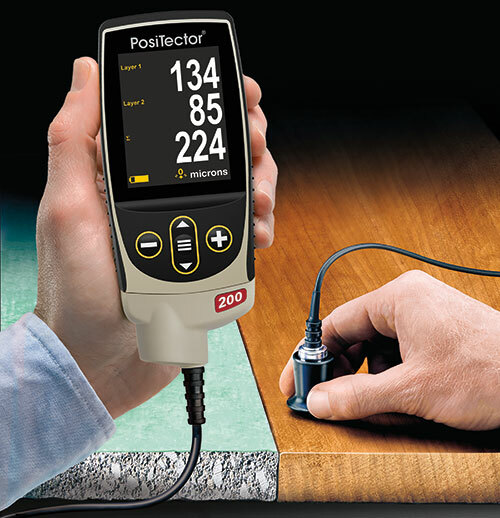 PosiSoft.net account - a free web-based application offering secure storage of thickness readings. PosiSoft Software - Continue using the familiar desktop software you have used for years. Available as a free download. PosiSoft Mobile - (Advanced models only) - access readings, graphs, capture photos and update notations through WiFi enabled devices such as tablets, smart phones and computers. Screen Capture - record and save image into USB flash memory for record keeping and review. Software updates via web keep your gage current. Storage of 250 readings in one group - stored readings can be viewed or downloaded. Measures the total thickness of a coating system or up to 3 individual layer thicknesses in a multi-layer system. Also features graphic readout for detailed analysis of the coating system. Store thickness, profile, environmental and wall thickness measurements in individual batches. WiFi technology wirelessly synchronizes with PosiSoft.net, downloads software updates & connects to mobile devices for expanded functionality. PosiSoft Mobile - gage based software application allows access to readings, graphs, capture photos and update notations through WiFi enabled devices such as tablets, smart phones and computers. Onscreen help, Real time graphing, picture prompting and more. Typical Applications: Polymer coating on wood, plastic, etc. Coatings on concrete, fiberglass, etc. **For multiple layer applications only. Dependent on material to be tested.